The JACO robot arm, developed by Kinova at its state-of-the-art R&D department, is a revolutionary device designed for multiple professional applications. It is a leading product in a new generation of lightweight portable robotic tools that enables users to interact with their environment with complete safety, freedom, and effectiveness. JACO moves smoothly and silently around 6 degrees of freedom with unlimited rotation on each axis. The axes are aluminum compact actuator discs (CADs) of a unique design. Each JACO robot arm consists of 2 distinct sets of 3 identical, interchangeable, and easy-to-replace CADs linked together by a ZIF (zero insertion force) cable. Its main structure, entirely made of carbon fibre, delivers optimal robustness and durability as well as a cutting-edge look-and-feel. The arm is mounted on a standard aluminum extruded support structure that can be affixed to almost any surface. 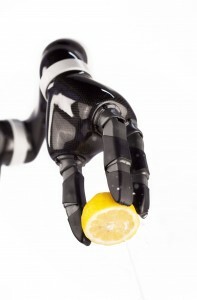 The gripper consists of 3 underactuated fingers that can be individually controlled. Their unique bi-injected plastic structure (patent pending) endows them with great flexibility and unrivalled grip. JACO technology allows the fingers to adjust to any object whatever its shape; as a result, they can gently pick up an egg or firmly grasp a jar. Targeted/Planned uses, and user groups: Rehabilitation, service robotics, mobile platforms, BCI manipulator. JACO can be controlled with a computer (see the “Software” section below) or Kinova’s 3-axis, 7-button joystick. Control is intuitive and allows users to navigate using 3 different modes: translate, rotate, and grip. Also, Kinova’s Intelligent Singularity Avoidance System always keeps JACO safely away from unwanted locations. JACO is highly flexible and can adapt to all user needs. JACO features an advanced application programming interface (API), enabling programmers to raise their experience to another level. The API, linked to JACO through a USB 2.0 connector, allows programmers to configure advanced parameters and integrate the robot to their own systems. In addition, JACO can be controlled with any one of many navigation systems, providing a broad range of applications from analyzing central system data to programming automated paths. The API comes with complete documentation and several code examples. In addition, new and exciting updates are available on a regular basis.